Lately, it seems like every expert and dietitian is recommending that people eat more protein. But do you know why? To make a long story short: protein is made of amino acids, and the human body needs amino acids in order to perform the basic biological functions that you need to survive. If you'd like to learn more about ornithine, then you're in the right place. Below, we'll explain to you everything you need to know about this amino acid, what it does, and how you can get more of it into your diet. We can even point you in the right direction if you're looking for an ornithine supplement that can help you improve your health and wellness. Ornithine is an amino acid which is essential for your body to function at its best. Unlike other amino acids, ornithine is known as a "non-protein amino acid". Contrary to what you may be thinking, no, that does not mean that ornithine doesn't come from protein. Rather, it means that your body doesn't use ornithine in order to synthesize proteins once it's in your system. Despite this, it plays some very important roles in your body. Ornithine is one of the most important molecules involved in the urea cycle in your body. Urea is the main component of urine, which is produced by your kidneys. In order to stay healthy, your kidneys have to filter out the wastes in your blood, convert them into urea, and excrete them. If this doesn't happen, then these toxins build up in your bloodstream and start doing a lot of damage. But the urea cycle prevents that from happening. Although your body doesn't use ornithine in order to make new proteins, it does help keep you healthy while your body is breaking proteins down. This is the most important part of the urea cycle, because the human body cannot live without breaking down proteins, rearranging their pieces, and building them back up into the enzymes your body needs for proper cellular function. Unfortunately, whenever your body takes a protein molecule apart, it produces ammonia. Yes, ammonia, the chemical that makes cat urine smell so bad. Thankfully, ornithine is there to swoop in, save the day, and bind to the ammonia molecule so that it is no longer toxic to your system. When this happens, the urea cycle transforms into the ornithine cycle. Ornithine then takes the ammonia to your bladder, where it will be excreted the next time you have to go to the bathroom. There are many different symptoms of toxic ammonia buildup in the body. The most common ones are depression, drowsiness, irritability, trouble speaking or recalling certain words, the inability to concentrate, poor memory, insomnia, and more. Your body may start to produce too much ammonia due to excessive protein intake (especially if you don't drink enough water) or due to problems with your liver. If you experience any of the symptoms, you may want to call your doctor. He or she can let you know whether you need to take a blood test to make sure your body isn't producing too much ammonia. But that's not all ornithine is responsible for in your body. It can help improve your circulation, reduce fatigue, and even speed up wound healing and post-exercise recovery. 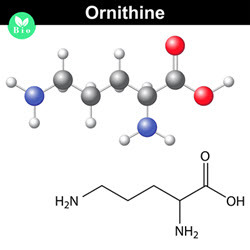 Your body uses ornithine to convert it into other specific amino acids (like arginine) which, in turn, help your body produce more nitric oxide. The more nitric oxide you have in your blood, the easier it is for your blood vessels to dilate. And, up to a certain degree, these dilated vessels are a good thing; they help blood reach tissues in your body that they wouldn't be able to if they were constricted, supplying a greater number of cells in your body with fuel and oxygen. The better your blood flow, the younger you will look in the healthier you will feel. Research in animals has also shown that your body produces more collagen when you have a healthy supply of ornithine in your system. Collagen is essential for wound healing, joint mending, and muscle repair (especially after a tough workout on an injury). And, as most women know, collagen is extremely important for keeping your skin tight, tone, and wrinkle-free. Clearly, ornithine is one of the most important amino acids for keeping you looking and feeling as healthy as possible. How Can I Get More Ornithine? Getting more ornithine into your diet is easier than you might think. As a matter of fact, your body can manufacture ornithine all on its own. But in order to do that, you have to feed your body another amino acid - arginine. The body breaks down arginine and uses the pieces to construct the ornithine molecule. So where do you get arginine? It's fairly simple. You can get plenty of arginine from regular protein sources, such as red meat, chicken, turkey, dairy products (like eggs, cheese, yogurt, etc. ), and fish. If you are trying to follow a vegan or vegetarian diet, you can also get arginine from sesame seeds, soybeans, and even peanuts. Of course, people with dietary restrictions or digestive disorders may still have trouble getting enough arginine into their diet. Furthermore, bodybuilders and fitness enthusiasts may also find it challenging to get enough arginine-rich protein into their diet. If you fall into any of these categories, then you may want to take an ornithine supplement instead. 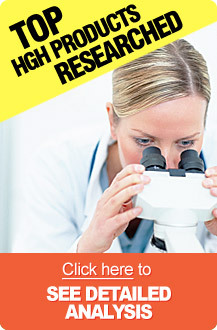 There are tons of ornithine supplements out there, so it may be difficult to find the right one. Lucky for you, we know of a great supplement that you can try: Ultra Edge XL. It contains several amino acids that your body needs - including an ample amount of ornithine and arginine. On top of that benefit, it'll also help your body produce more of something called human growth hormone. Scientists have started calling human growth hormone (HGH for short) the "fountain of youth" due to the way it improves health and wellness in the human body. So if you're ready to help your body produce more ornithine and human growth hormone, give Ultra Edge XL a try today.